POLITICAL TIDBITS: Close encounters with Henry Sy, said to be the richest Filipino, in the very early years in his Carriedo shoe store. He was always patient and smiling, no matter how fickle or hard to satisfy, or penny-pinching customers would be. Close encounters with Henry Sy, said to be the richest Filipino, in the very early years in his Carriedo shoe store. He was always patient and smiling, no matter how fickle or hard to satisfy, or penny-pinching customers would be. When my father's business collapsed in the late '50s, my parents had to make the tough decision to keep us 10 children in the schools where we had begun studying during the prosperous years. This involved six boys studying in the Ateneo de Manila, earlier situated in Padre Faura and later transferred to Katipunan in Quezon City, and three girls in Holy Ghost College under German and American sisters---later renamed the College of the Holy Spirit---on Mendiola St., Manila, sandwiched between Malacanang Palace and San Beda College. The eldest of the brood of ten, our Ate Elvy, was by then studying in UST. My mother, who was a working student at the old UP in Manila, was determined to keep her entire brood in the schools where we had begun---against the vigorous protestations of my father whose business was in ruins. My mom won, but it meant a lot of belt-tightening for all of us and negotiations galore with school authorities to allow deferred payment of tuition fees. For us three Holy Ghost colegialas, it meant walking daily the entire route from Mendiola to Quiapo, where we would take the bus to Quezon City. We had moved to QC from the big ancestral home in Sta. Mesa Blvd., as my parents were forced to sell it, owing to the business collapse. Walking all the way to Quiapo was fun, though, as there were quite a lot of us students walking together. From time to time we would break up the monotony by sauntering over to Carriedo St. where a tall lanky Chinese entrepreneur perhaps in his late '30s had set up a modest shoe store called "Shoemart." This youthful Chinese shoe-store owner/salesman had stacks of shoes in boxes neatly arranged on shelves up to the ceiling of the store and he personally attended to each customer. In those days, he himself would sit on a low wooden stool in front of the customer---helping him or her with several pairs of shoes to try on. "Ay, medyo tight itong pares na ito," I'd complain, and the store-owner would patiently get up and climb the ladder to get more stocks from the ceiling. He'd bring the new pairs and sit down again on the low stool in front, helping us to try new ones. Sometimes the shoes would fit, but at times we customers would change our mind about them and walk around again, looking at some other pair. 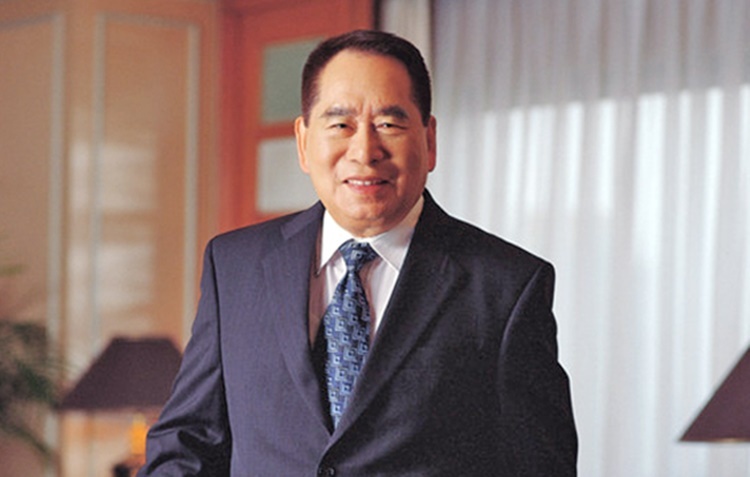 Henry Sy must have thought at that time that there must be an easier way to make a living. This tall, rather slender young Chinese store-owner would always retain the patience of Buddha toward us pesky colegialas. After I left Holy Ghost College and entered the University of the Philippines in Diliman, Quezon City, I continued to visit Shoemart in Quiapo, as Mr. Sy's goods were reasonably priced. I also have good memories of his kindness and courteousness, the semi-serious smile on his face and the broken Filipino he could speak at that time. Little did I ever imagine that the same over-patient shoe-store proprietor would one day turn out to be the entrepreneur adjudged by Forbes Magazine as the Philippines' richest man for 11 SUCCESSIVE YEARS---with an estimated worth of $9 billion or P1.05 trillion! As the Inquirer pointed out, according to Forbes Magazine, Henry Sy, as the 52nd richest person in the world last year, elbowed out tycoons such as Elon Musk, Rupert Murdoch and George Soros from the magazine listing. Little would I have imagined too at that time when we would casually saunter into that little shoe store on Carriedo St. in Quiapo, that it would become the flagship of his vast family conglomerate. That little Shoemart store would morph into the SM Department Store with many dozens of branches sprouting all over the country---a vast pillar of the Philippine economy---with ultimately the SM Megamall and the Mall of Asia dwarfing them all. Little would I have imagined that from that little Carriedo St. shoe store, the fortunes of this ever-patient shoe-store owner would diversify in about three decades to include vast holdings in retail, banking and property development all across the country and the region, including in Henry Sy's native China. Little did I imagine that that Carriedo shoe store would one day create not only a new verb---"malling"---but also a distinct way of life among us Filipinos, that would help rev up the economy and provide countless job opportunities. A young lanky Henry Sy in front of his shoe store on Carriedo St. in Quiapo, Manila. Obviously Henry Sy and his very religious wife Felicidad (who built the beautiful Sto Nino Church in the reclamation area near the Mall of Asia) brought up their children very well---equipped with the same work ethic that enabled them to take over the empire when retirement became imperative for the patriarch of the dynasty. What's great about this family is the way Henry Sy trained his children to take charge of specific holdings. Tessie Sy Coson, the eldest of the brood of Henry and Felicidad Sy and one of their two daughters (the other daughter is Elizabeth and there are four sons, namely Henry Jr., Hans, Herbert and Harley), has headed the Sy business empire for some time now, and she and her siblings have continued the many philanthropic works of their parents. A little episode indicates to me the kind of training she received from her father. One evening, Tessie Coson attended the concert of the young Mozarteum-trained Filipino classical violinist Joaquin "Chino" Gutierrez at the Francisco Santiago Concert Hall in the BDO Bldg. that the Sy family owns. Friends of the young violinist had invited her to attend the concert and hear this music sensation, but half-way through the program, she bade goodbye to me as she had to rush somewhere else. I accompanied her to the concert hall door and at that point I suddenly remembered the repeated request of senior theater-goers about the need to put hand-railings for the eight or so steps reaching up to the BDO concert hall, to prevent accidents especially for seniors. Tessie Coson listened attentively, but more than that, she quickly took out her cellphone from her bag and took photos of the staircase and the walls needing hand-railings. I thought that this lady now heading the family business empire could just have directed a staffer to attend to the concert-goers' request; but no, she had to produce the evidence herself---doubtless to produce quicker results. No wonder, I thought to myself, that the family business empire has been so successful---every conceivable detail is covered. My profound sympathies to the Sy family over the demise of their beloved patriarch.